Friends are like sprinkles on a birthday cake—you can never have too many! So when a new girl named Margot joins the class, Veronica and her BFF, Cora, welcome her with open arms. Everything about Margot is super exciting— from her fashion designer mom to the perfect French she speaks—and everyone loves her. Especially Cora. Before long, Cora and Margot have matching outfits and rhyming nicknames. 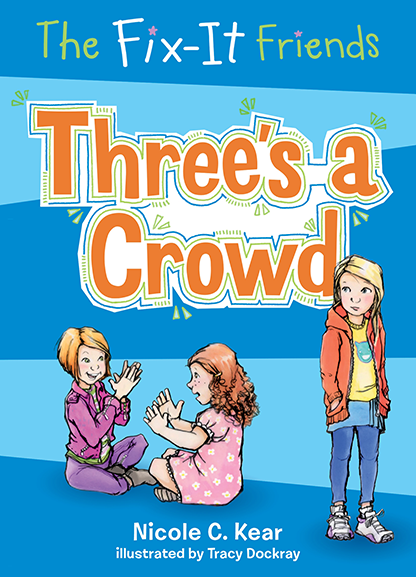 Veronica feels left out, big time, but she won’t give up on her best friend without a fight. Trouble is, the harder she tries to hold on to Cora, the more she pushes her away—until the two besties end up in a showdown that hurts more than just feelings. It’s a job for the Fix-It Friends, to be sure. But can the president of the problem-solvers accept help herself?